My new plan was not a miracle worker but I must say that things went much smoother this week then in the past. I started off the work week on Tuesday because Monday was a paid Holiday. :) Tuesday morning I threw the ingredients for Crockpot Balsamic Chicken in the crockpot when I got up and by the time I got home I had one of the best tasting meals that I have had in a long time. I was very pleased with this recipe and with my new crockpot. 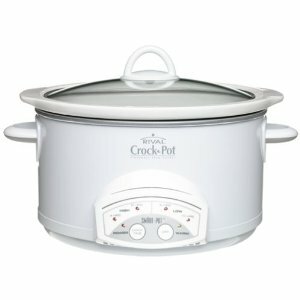 My new crockpot is very similar to this one from amazon.com. I love it because it has a timer and once the time goes off it automatically goes to warm and keeps my food warm until I get home. I would highly recommend this type of crockpot to anyone who needs to leave their crockpot on for a long period of time when they aren't home. It's a life saver. I found mine at Sam's Club before Christmas for approximately $17. It was a great buy! I have to tell you that I noticed such a difference in my attitude throughout the days that I did this compared to the past. I feel calmer and so much more refreshed. It's just a good way to start your day. Reading God's word in the morning makes you look at the world so much differently throughout the day. My breakfast was homemade bread with almond butter. The paper products with our dinner have been a huge help. I only ran the dishwasher once this week and that was last night. I washed all of the pots and pans that I used to cook by hand and the rest of the silver wear and cups went right into the dishwasher. I wrote in my new plan post that I was going to try crockpot liners with our meals. Well, I tried them this week and they are awesome! They are worth the money. It was so nice to not have to scrub the dried food off of my crockpot each night. I will not use my crockpot without them from now on. Wednesday we went to dinner with friends. We went to a new interactive play area for kids and ate dinner there and let the kids play. It was so nice to let the kids run around and play while the adults talked and waited for the food. Then we let the kids eat and play some more until we were ready to leave. The food was great and it was so nice to spend time with our friends in a relaxed environment. This is a picture of Thursday's dinner. It was one of my own creations of, Crockpot Mushroom Pot Roast, mashed potatoes, and green beans. I put it in the crockpot before work for about 5 hours on low and came home to this. It was so good! This recipe is our favorite from the week. Thursday was a really rough day. I didn't sleep well on Tuesday or Wednesday night so Thursday was a hard day to get through at work. I was happy to have this meal made when I got home. I ended up taking two Tylenol pm before bed and sleeping like a baby Thursday night. It made Friday much more enjoyable. Friday's dinner was Blackberry BBQ Pork Tenderloin. This is another recipe the I really love. The flavors mix so well together and it is so easy to make. I put it in the crockpot for 5 hours on low and came how to a very tender pork tenderloin. I love to put the extra liquid over my rice. It has great flavor. I have two pictures posted below. The broccoli took a little longer to cook so I had to add it to my plate a little later in the meal. I didn't want you to think that I didn't eat a veggie with my meal. ;) I love broccoli florets! They are so much better then broccoli cuts. Today is the start to a great weekend! I woke up early and made the family French Toast and sausage. I made myself this. Here is a link to the recipe. So yummy! This is a picture of MJ watching Disney's Robin Hood this morning. She is so funny! Thanks Kim! You are so right and that is the most important part. :) Thanks for the encouragement!